So a babe is on the way? Congrats! Along with the chaos of, well, everything that is to come, your finances are about to experience an upheaval as well. According to the U.S. Department of Agriculture, it will cost upwards of $245,000 to raise a child born in 2013 to the age of 18 – and this does not include college. Feeling that bank account burn already? 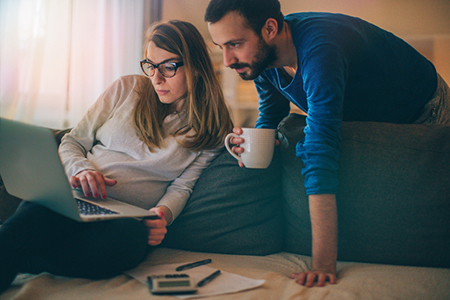 Below are five tips for rocking your budget as a new mom or dad. 1. Tweak the budget. Your new little one is going to cost a pretty penny. From hospital costs to diapers and child care, budgetary stress is an added strain on you as a new mom or dad. Look for any un-necessaries you can slash to make room for more baby dollars. The more prepared you are, the better. 2. Track your spending. Don’t just make that budget and set it aside. Set a monthly meeting with your spouse to look over your spending, make sure you’re on track, and identify any problem areas or potential saving pockets. 3. Learn your tax credits. I bet you didn’t see this one coming. Being a parent has some advantages at tax time, so talk to your tax professional about the child tax credit, the earned-income tax credit (EITC), and the child and dependent-care credit, all of which can save you mad money come tax tie. 4. Automate, automate, automate. Not only can automation help you avoid bouncing bills, but by having money withdrawn from your account, you can pad up your savings, too. Figure out how much you can part with every month and automatically squirrel it away into an emergency savings account, a college savings account, or both. 5. Set financial goals. While creating a budget and savings plan is great, setting goals for your family can help you stay on track. Looking to have a set amount in a college account by the time your kid hits 18? Do the math and decide how much you need to save monthly to hit it. Is an annual family vacation a must for connecting? Figure out how to stash some cash for that, and then make it happen. Also stay well informed on real estate market trends if you’re looking to buy a home or move-up to a larger one. Above all, don’t forget to be realistic, and forgive yourself if it takes some time to get on track. Parenting is a life-long adventure!